Other Gaiman works can be download via Audible.com's special Free Trial. More details here. May your coming year be filled with magic and dreams and good madness. I hope you read some fine books and kiss someone who thinks you're wonderful, and don't forget to make some art - write or draw or build or sing or live as only you can. May your coming year be a wonderful thing in which you dream both dangerously and outrageously. I hope you will make something that didn't exist before you made it, that you will be loved and you will be liked and you will have people to love and to like in return. And most importantly, because I think there should be more kindness and more wisdom in the world right now - I hope that you will, when you need to, be wise and that you will always be kind. And I hope that somewhere in the next year you surprise yourself. Mark Linsenmayer runs the Partially Examined Life philosophy podcast and blog. He also performs with the Madison, WI band New People. In 1952, John Cage composed his most controversial piece, 4′33,″ a four-and-a-half minute reflection on the sound of silence. Now fast forward eight years. It's February, 1960, and we find the composer teaching his famous Experimental Composition courses at The New School in NYC, and paying a visit to the CBS game show "I've Got a Secret." The TV show offered Cage something of a teachable moment, a chance to introduce the broader public to his brand of avant-garde music. Cage's piece is called Water Walk (1959), and it's all performed with unconventional instruments, save a grand piano. A water pitcher, iron pipe, goose call, bathtub, rubber duckie, and five unplugged radios -- they all make the music. And the audience doesn't quite know how to react, except with nervous laughter. It wasn't particularly courteous. But, as one scholar has noted, it's equally remarkable that prime time TV gave ten minutes of uninterrupted airtime to avant-garde music. You take the good with the bad. 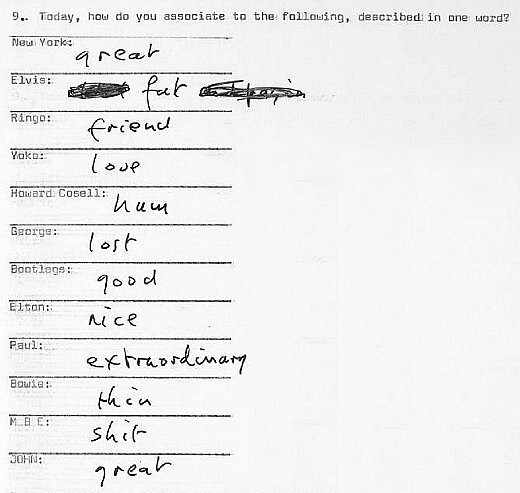 In 1976 a youthful fan named Stuart sent John Lennon a six-page list of questions. The former Beatle responded with answers, along with a child-like drawing of a lamb standing on a cloud, saying, "Hi Stuart." Stuart wanted to know a few things, like what sort of album Lennon was working on. "Until it's been on tape," Lennon replied, "I never know what it will be." He also wondered if the famous musician was writing anything, like perhaps an autobiography. "Yes, I have been writing, but not an autobiography. I've noticed that people tend to DIE after writing their life story." The young fan included a list of words and names, along with the question: How would you characterize the following figures in one word? Lennon signed off with, "It was a pleasure, hope ya dig it/John Lennon." "Civilization begins with distillation," William Faulkner once said, and like many of the great writers of the 20th century -- Ernest Hemingway, F. Scott Fitzgerald, James Joyce -- the bard of Oxford, Mississippi certainly had a fondness for alcohol. Unlike many of the others, though, Faulkner liked to drink while he was writing. In 1937 his French translator, Maurice Edgar Coindreau, was trying to decipher one of Faulkner's idiosyncratically baroque sentences. He showed the passage to the writer, who puzzled over it for a moment and then broke out laughing. "I have absolutely no idea of what I meant," Faulkner told Coindreau. "You see, I usually write at night. I always keep my whiskey within reach; so many ideas that I can't remember in the morning pop into my head." The maddening thing about Bill Faulkner was that he'd go off on one of those benders, which were sometimes deliberate, and when he came out of it, he'd come walking into the office clear-eyed, ready for action, as though he hadn't had a drink in six months. But during those bouts he didn't know what he was doing. He was helpless. His capacity wasn't very great; it didn't take too much to send him off. Occasionally, at a good dinner, with the fine wines and brandy he loved, he would miscalculate. Other times I think he pretended to be drunk to avoid doing something he didn't want to do. Wine and brandy were not Faulkner's favorite spirits. He loved whiskey. His favorite cocktail was the mint julep. Faulkner would make one by mixing whiskey--preferably bourbon--with one teaspoon of sugar, a sprig or two of crushed mint, and ice. He liked to drink his mint julep in a frosty metal cup. (See image above.) 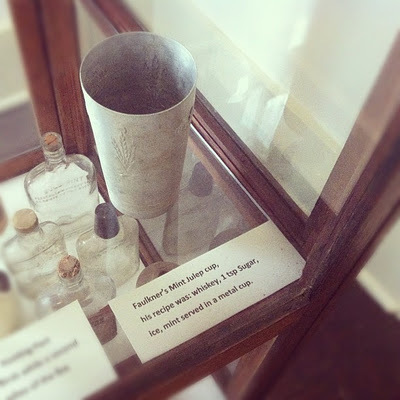 The word "julep" first appeared in the late 14th century to describe a syrupy drink used to wash down medicine. Faulkner believed in the medicinal efficacy of alcohol. Lillian Ross once visited the author when he was ailing, and quoted him as saying, "Isn't anythin' Ah got whiskey won't cure." Pappy alone decided when a Hot Toddy was needed, and he administered it to his patient with the best bedside manner of a country doctor. He prepared it in the kitchen in the following way: Take one heavy glass tumbler. Fill approximately half full with Heaven Hill bourbon (the Jack Daniel's was reserved for Pappy's ailments). Add one tablespoon of sugar. Squeeze 1/2 lemon and drop into glass. Stir until sugar dissolves. Fill glass with boiling water. Serve with potholder to protect patient's hands from the hot glass. Pappy always made a small ceremony out of serving his Hot Toddy, bringing it upstairs on a silver tray and admonishing his patient to drink it quickly, before it cooled off. It never failed. In this video created by the Guardian, writer and award-winning documentary filmmaker Errol Morris talks about the nature of truth, art, and propaganda in photography. He draws examples from the photographs of Abu Ghraib and the Crimean War, both cited in his book Believing is Seeing, and he asks the viewer to consider a most fundamental question: how does a photograph relate to the physical world? Unlike a verbal or written statement, a photograph cannot be true or false. It simply is. Then comes another argument worth considering -- the idea that all photographs are posed. By way of example, Morris cites an instance where a photographer (in this case Roger Fenton) omits an elephant standing outside the frame. And it leads Morris to suggest that we shouldn't take photos at face value. Rather we should do our due diligence to find out whether there isn't always a metaphorical elephant looming beyond the frame. As Morris states, a photograph decontextualizes everything. It reveals to us a two dimensional reality that's "been torn out of the fabric of the world." This video is part of the Guardian's "Comment is Free" series, in which the world's top thinkers, newsmakers, and people with stories to tell are interviewed. For more meditations on photography, give some time to Errol Morris' speech at the Harvard Bookstore. Find the transcript here. 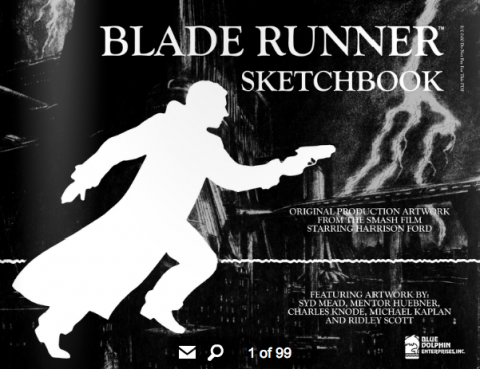 Coinciding with the release of Blade Runner in 1982, David Scroggy published the Blade Runner Sketchbook, a book with 100+ production drawings and artwork for Ridley Scott's classic sci-fi film. The sketchbook features visual work by Scott himself, artist Mentor Huebner, and costume designer Charles Knode, but most notably a slew of drawings by artist, futurist, and illustrator Syd Mead. As Comics Alliance notes, this sketchbook has been out of print for years and scant few paper copies remain available for purchase. So digital versions have filled the void online, and now comes this: a version that lets you revel in the Blade Runner artwork in full-screen mode. Enter the sketchbook by clicking the image above or below. (The book itself is hosted at Isuu.com). Once you get there, click the images and they'll fill your screen. Let's do the time warp today and revisit the Not-S0-Golden Age of American Television. The year was 1978. Star Wars fever still gripped America, and the Variety Show TV format wouldn't say die. So, producing The Star Wars Holiday Special (find Part 1 above, Part 2 here) was a no-brainer. The two-hour show takes you inside the domestic world of Chewbacca and his family -- his father Itchy, his wife Malla, and his son Lumpy -- and features guest appearances by Jefferson Starship, Harvey Korman and Bea Arthur, plus a little stock footage of Alec Guinness. As for the production quality and special effects? They're all textbook kitsch. You've heard enough to know that this wasn't the finest hour for the Star Wars franchise. One critic called it the "the worst two hours of television ever." And, when he's willing to acknowledge the existence of the TV special, George Lucas readily admits that turning Star Wars into a variety show "wasn't the smartest thing to do." But because the show only aired once in its entirety, the holiday special has gained something of a cult status and circulates "underground" on the web. Vanity Fair has more on this misadventure in television programming here. H/T goes to Dangerous Minds.